Marie, of My Embroidery Haven, has a yahoo group where members can receive wonderful freebies. Once such freebie was the Magnificience Monogram set. (It's no longer free but still avaialble, along with coordinating borders, frames and circles) I thought this design would look spectacular in the corner of dinner napkins and beautifully match my plates. Most of the letters used for the initials look quite wonderful, but the "R" that I wanted (for our surname) didn't look too much like an "R" to me. (Sometimes fancy letters just turn out that way). With Embird and the way that Marie had digitized the design, it was easy enough to separate the letter from the rest of the design and merge a letter from another alphabet package, resulting in the design you see above. (Later on, Marie thoughtfully provided us with a blank design, so that we could then use whatever letter or other design element we wanted in the center oval). Normally, I make my own napkins (they aren't that difficult and I especially like making flat, mitered corners) but I happened to see a local store offer 12 dinner napkins for $10. Knowing that I couldn't make a dozen for that price, I bought 2 sets; one in white and one in ecru. I should have known that you don't get something for nothing. I should have carefully looked at the napkins before I started stitching but I was eager to see the final product. So, I shouldn't have been surprised when I eventually discovered that these napkins were nowhere near to being square. The best you could say of some of them is that they had four sides. [sigh] But I stitched the entire set anyway, as I just didn't have the time before Thanksgiving to make and stitch a set of napkins. Marie's designs stitch out wonderfully but I did experience a small problem with some of the napkins. 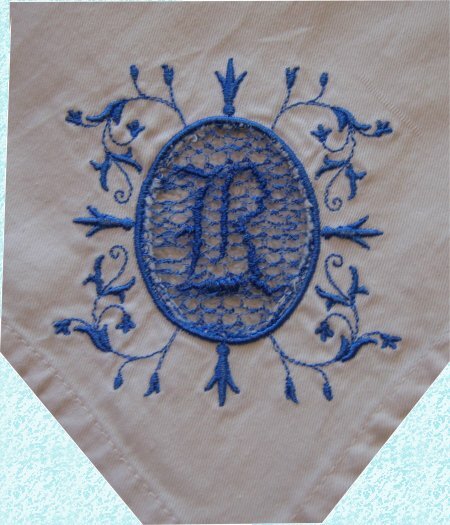 The central oval is made up of a netting background, on which the letter is then stitched. It was after I had washed the tablecloth and napkins that I discovered that on some of the napkins the netting had become detached so there were "holes". It was easy enough to hand stitch back together, but I wonder what caused some to tear and some not. I had hooped the napkin itself and put a piece of heavy duty Solvy where the central oval was going to be, so that the netting background would have something to stitch on. I know this motif is designed to be a cutwork but perhaps I should have used a fibrous water soluable stabilizer instead of the film type. I'm not quite sure. However, I'm not at all happy with my non-square napkins so I am going to re-do the entire set properly. For the next stitching, I will also put down a piece of tulle in addition to the water soluable stabilizer so that there will be no chance of the stitched netting background coming apart. The ecru napkins (from the same store) were done a little differently. Instead of an interior cutwork design, I did a corner design. The idea came from a new embroidery magazine, Flair, published in England. One feature article showed a Sue Box design stitched on the corner of a napkin. After stitching, the napkin was cut away leaving just the lacey design. The magazine gives very clear instructions on the sequence of steps to do this project. I knew I had a couple of Sue Box freebies and although it wasn't the same lovely bell design as in the magazine, it was still very much suitable for Christmas. Now, at this point, I would be delighted to give you the URL where to find the Sue Box freebie. Do you think that I can find it? Of course not. I can't even find it on my computer! I know it's there because I changed the color scheme slightly. Obviously I saved it in such a Safe Place that I can't remember where it is. Gosh, I just love getting old. I was playing around with a couple of different color schemes, which you see to the left. The top design has a variegated dark maroon thread for the berries and gold metallic thread for the corner stars, berry outline and faggotting around the curved upper edges. The bottom design used a solid deep red for the berries and a deep gold color (but not metallic). Unfortunately, as with the white napkins, the ecru napkins are also out of square, but not as horribly as the white ones.